Country House Weddings’ latest venue, Holmewood Hall, is a Tudor-style mansion in Peterborough, Cambridgeshire. Calico was very hands-on with this project, working in two phases to help renovate many of the 15 rooms, including Lady Elizabeth, Lady Lake, and the Renaissance Bridal Suite. 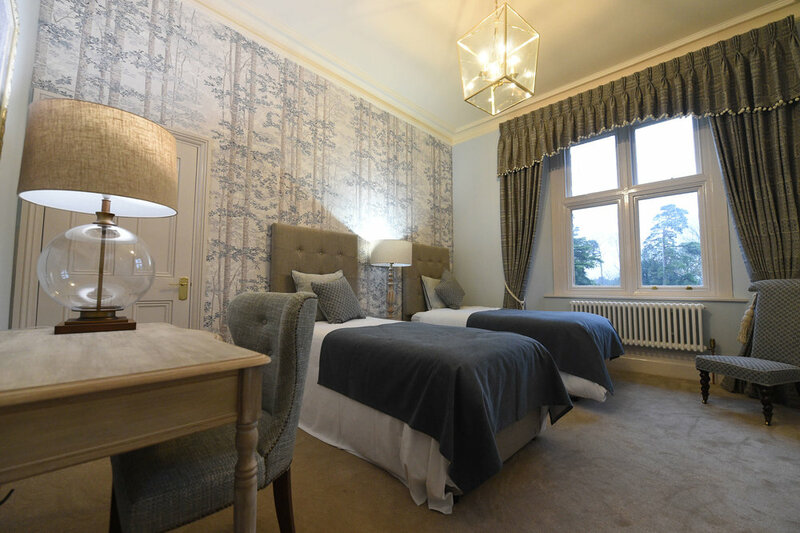 We selected the furniture and wallpaper, as well created the soft furnishings for the rooms. The Renaissance Bridal suite, which comes with a dressing room and en-suite, reflects the grandeur of the manor and its colour scheme channels The Gold Room, where the ceremonies take place. We created swags and tails to add a traditional touch, plus a beaded trim for an opulent finish. The Lake Lake suite, which was designed for the parents of the bride, has a contrasting colour scheme of light pinks and greens, adhering to the Tudor-like style of the mansion. Lady Elizabeth, the twin room, was similarly designed. Most of the fabrics and wallpapers selected were supplied by Lewis & Wood, Osborne & Little, and Nina Campbell.